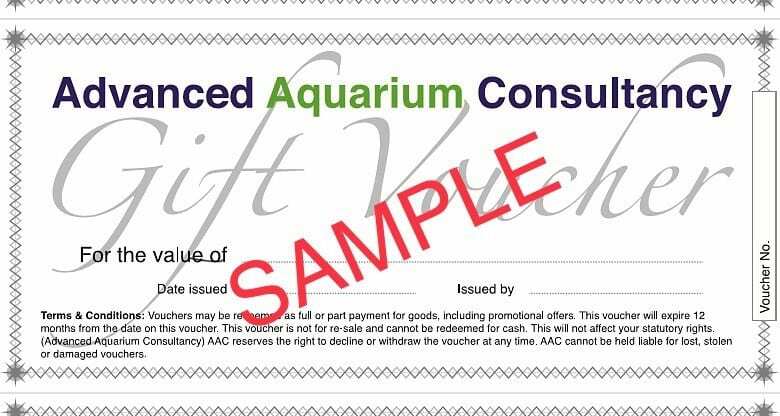 The AAC Gift Voucher is the ideal purchase if you wish to treat your family and friends to something within the hobby, but are stuck for ideas! 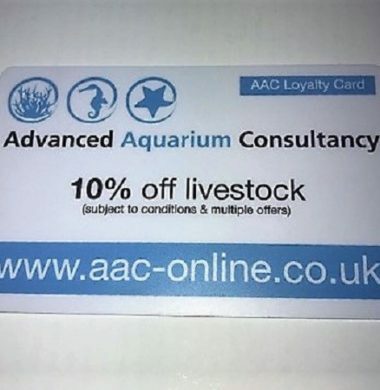 AAC Gift Vouchers are for use when you visit us in-store, to save you money against both Livestock and Dry Goods! The AAC ‘Trapaclimate XXL’ Fish Trap and Acclimation Box is the latest high quality Fish Trap and Acclimation Container manufactured entirely in the UK by HM Reef in conjunction with us here at AAC. 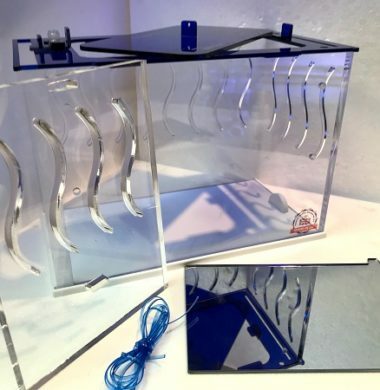 The ‘Trapaclimate’ fuses both conventional Fish Trap and Acclimation Box together, to allow the Aquarist to safely add new fish species to their Aquarium, as well as remove those that are no longer suitable to be housed in the system. See below for more information on the AAC ‘Trapaclimate’ and its features! Please see our other accessories in the AAC ‘Trapaclimate’ range, including the ‘Trapaclimate’ ‘Trapstraps’ and ‘Trapaclimate’ ‘Wrasse Tray’. Fast, Free, Next Working-Day Delivery! 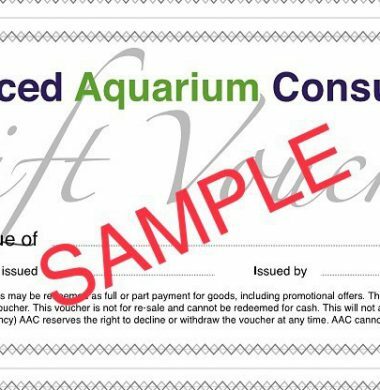 The AAC ‘Trapaclimate XL’ Fish Trap and Acclimation Box is the latest high quality Fish Trap and Acclimation Container manufactured entirely in the UK by HM Reef in conjunction with us here at AAC. 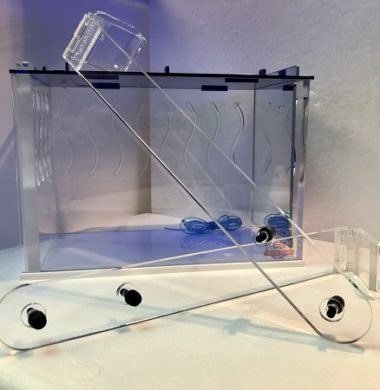 The ‘Trapaclimate’ fuses both conventional Fish Trap and Acclimation Box together, to allow the Aquarist to safely add new fish species to their Aquarium, as well as remove those that are no longer suitable to be housed in the system. See below for more information on the AAC ‘Trapaclimate’ and its features! The AAC ‘Trapaclimate’ ‘Trap Straps’ are the latest design in Fish Trap and Acclimation Box Mounting, made entirely in the UK by HM Reef and us here at AAC. The ‘Trap Straps’ allow the Aquarist to mount the ‘Trapaclimate’ to Braced and Rimless Aquariums, without impeding on space or the overall look of the tank itself. The AAC ‘Trapaclimate XXL’ ‘Wrasse Tray’ is the latest design in holding sand for sand-dwelling wrasse species, designed and manufactured entirely in the UK by HM Reef and us here at AAC. 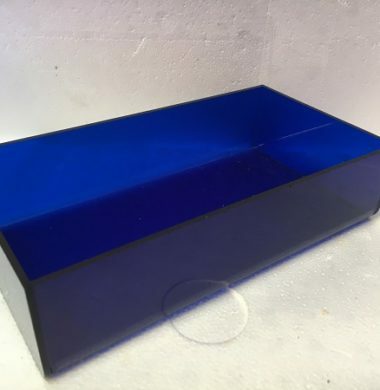 The ‘Wrasse Tray’ enables the Aquarist to safely introduce difficult sand-dwelling wrasse species to their Aquarium, in an appropriate environment necessary to encourage and prolong their survival. The AAC ‘Trapaclimate XL’ ‘Wrasse Tray’ is the latest design in holding sand for sand-dwelling wrasse species, designed and manufactured entirely in the UK by HM Reef and us here at AAC. The ‘Wrasse Tray’ enables the Aquarist to safely introduce difficult sand-dwelling wrasse species to their Aquarium, in an appropriate environment necessary to encourage and prolong their survival.